We’d love your help. Let us know what’s wrong with this preview of Spies in St. Petersburg by Katherine Woodfine. To ask other readers questions about Spies in St. Petersburg, please sign up. It's always a joy to travel along with Sophie, Lil and the gang and this time we're in Imperial Russia for an exciting, espionage adventure. Building on the events of the first book in the Taylor & Rose series, we find out more about about characters from that story and also learn a little more about the dangerous and mysterious Fraternitas Draconum. It's a pacy adventure that will leave you wanting more, can't wait to find out where book 3 will take us. 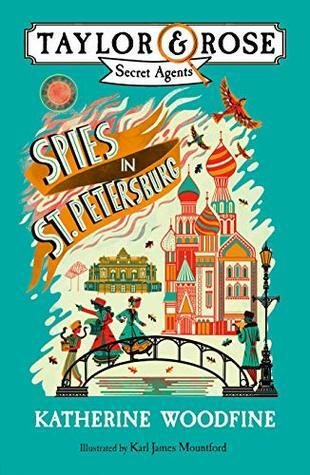 ** Recieved a free Digital copy of this It's always a joy to travel along with Sophie, Lil and the gang and this time we're in Imperial Russia for an exciting, espionage adventure. Building on the events of the first book in the Taylor & Rose series, we find out more about about characters from that story and also learn a little more about the dangerous and mysterious Fraternitas Draconum. Katherine Woodfine is the author of the bestselling SINCLAIR'S MYSTERIES series, beginning with THE CLOCKWORK SPARROW which was shortlisted for the Waterstones Children’s Book Prize, longlisted for the Branford Boase Award, and nominated for the CILIP Carnegie Medal. Until 2015 she worked for reading charity Book Trust on projects including the Children’s Laureate and YALC. She now combines writin Katherine Woodfine is the author of the bestselling SINCLAIR'S MYSTERIES series, beginning with THE CLOCKWORK SPARROW which was shortlisted for the Waterstones Children’s Book Prize, longlisted for the Branford Boase Award, and nominated for the CILIP Carnegie Medal.